No one wants to look older than what they are. Those little crows feet that creep in around your eyes are definitely a dead giveaway. Tiny, fine lines can lead to deep crevices if you aren't careful. No one wants to have the Grand Canyon around their eyes. Stop the damage before it's too late with Perfective Ceuticals. This anti-aging, anti-imperfection Eye Therapy contains both collegian and Elastin stimulators to help rebuild the dermal matrix. What does this mean to you? 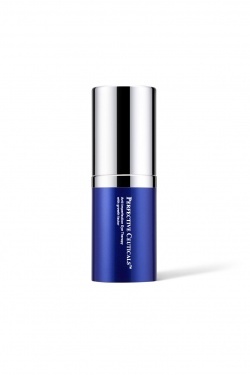 This product helps to reduce the length and depth of fine lines and wrinkles. The area around your eye is improved by increasing its elasticity. After all, radiant, youthful eyes can make you look at young as you feel. Recently I have been using the Eye Therapy in addition to my daily moisturizer. I would say that my eye area looks less tired looking. While I didn't have a lot of fine lines, I did lack elasticity. My eye area looked tired and the skin looked thin. Plus, I didn't like the dark circles. With use, my eye area looked fuller and the dark circles are reduced. So far, I am pleased with the results and I plan on continued use. Stop the deep, unforgiving crows feet and dark circles before they take over your youthful appearance.